EXECUTIVE SUMMARY: Hamas has built up its military wing at the expense of ordinary Gazans, for whom it has completely failed to provide reliable civilian services. Its insistence on focusing exclusively on its military capability keeps tensions high with Israel and renders reconciliation with the Palestinian Authority a near-impossibility. Tensions between Israel and Hamas in the Gaza Strip remain high following a period during which Gazan terror factions fired large numbers of projectiles at southern Israeli regions, drawing return Israeli airstrikes. Mass arson attacks targeting Israeli farms and villages, orchestrated by Hamas, have not yet stopped, and an Egyptian-brokered ceasefire is shaky at best. The very issues that caused Hamas to escalate tensions in the first place – Gaza’s isolation and faltering economy, and Hamas’s desire to change both – remain in place, meaning conflict could flare up again very swiftly. Ultimately, these events appear to be symptoms of a larger failure by Hamas to turn Gaza into a viable, civilian state-like entity, due to its fixation on armed conflict with Israel. It has built up its military wing at the expense of the needs of ordinary Gazans. Yet Hamas’s refusal to compromise on its armed wing is exactly what is causing the Palestinian Authority to isolate Gaza, to reduce funds to the enclave to a bare minimum, and to view Hamas as a dangerous enemy. This is why efforts at reconciliation between Hamas and the Palestinian Authority have so far been doomed to fail. Egypt too has not changed its basic suspicion of Hamas. Israel, though keen to improve Gaza’s economy, remains highly threatened by Hamas’s activities. As a result, Gaza remains isolated, and the countdown to an economic collapse continues. “The Hamas leadership in Gaza is in an ongoing crisis situation that is getting more severe,” says Professor Boaz Ganor, founder and executive director of Israel’s International Institute for Counter-Terrorism in Herzliya. A substantial portion of Gazans who lost their homes due to the 2014 conflict between Hamas and Israel have not yet received permanent new housing. These developments are causing real fractures in Palestinian society, particularly in Gaza, observes Ganor. Added to this is Hamas’s all-time low status in the international arena. Qatar, a traditional Hamas supporter, now faces accusations by Arab states that it is supporting radical Islamist terrorists. Today, he says, Hamas is left only with non-Arab supporters – Turkey and Iran – whose assistance to Hamas actually complicates its relationships with Arab states. 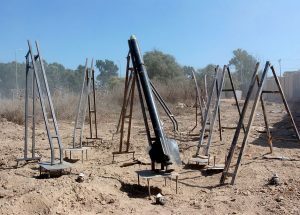 In the meantime, Israel is successfully destroying Hamas’s cross-border attack tunnels “one after the other, and all of Hamas’s efforts to dictate new “rules of the game to Israel have failed to bear fruit,” states Ganor. In this situation, Hamas’s leaders have placed their hopes on Egypt and other Arab states to broker a new ceasefire agreement with Israel and ease the security blockade on Gaza, at least from the Egyptian side. Hamas also hopes Egypt can enable a breakthrough reconciliation with the Palestinian Authority. In light of this complex state of affairs, neither Hamas nor Israel has any interest in a serious security escalation. Nevertheless, Ganor cautions that if Hamas sees its attempts to court the Egyptians, the Saudis, and the PA end in failure, the group could resort to escalation as a desperate last measure. “Until then, it seems they will try to limit the fire and restrain rebellious elements in the Strip,” says Ganor. For its part, Israel would also like to avoid any major escalation, “let alone go to full-blown war,” according to Miller. This is an edited version of an article that was first published on JNS.org on July 20, 2018.